Have you ever tried painting your own pottery? I’ve noticed quite a few ‘paint your own’ places springing up across England and I can see why they’re a success. Not only is it very relaxing, it’s good for all ages and abilities. I finally had a go during a trip to Birmingham where I was visiting a good friend of mine, Abi. We took her nine-year-old step-daughter, Orla, and honestly, I don’t know who enjoyed it most. Coincidently, the place (All Fired Arts) is run by another friend of mine, Annie, who I know from living in Brum for a few years. It was great to see her doing something so fun and creative – although she has always been that kind of gal. It can be a bit expensive (especially if you take little ones who are both enthusiastic and quick at painting!) 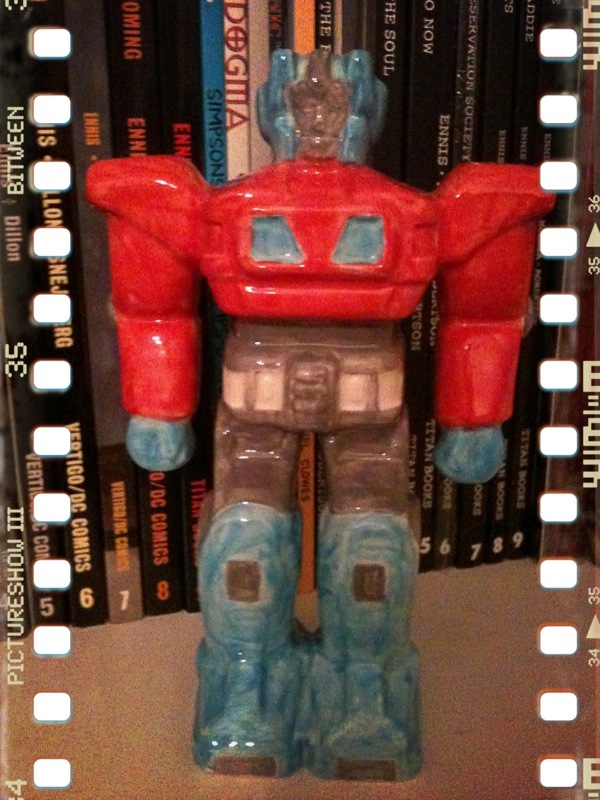 I also wanted to paint everything – especially the cute cups and saucers and the ceramic slices of cake, but I opted for Optimus Prime for my fella because he says I never make him anything (he fibs). The trick to this is to paint at least three layers and in fairness to the lovely ladies who work there, I was told! Somehow – with all the girl chat and concern that I was getting Optimus’ colours wrong (Mr. Lola is a bit of a geek so would certainly notice) – it took two hours just to do one thick coat. So, it’s a little patchy but I like that it doesn’t look shop bought. 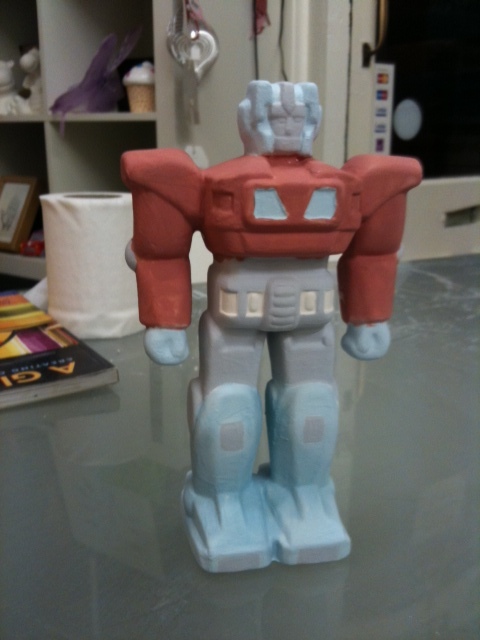 Optimus Prime in pottery and badly painted form! My crazily generous brother recently gave me a crazily large flat screen TV (ah, bro love!). It was that big I couldn’t squeeze it into the dedicated TV space. Hmm, what to do? Is it me, or does the answer to everything seem to involve crafting? 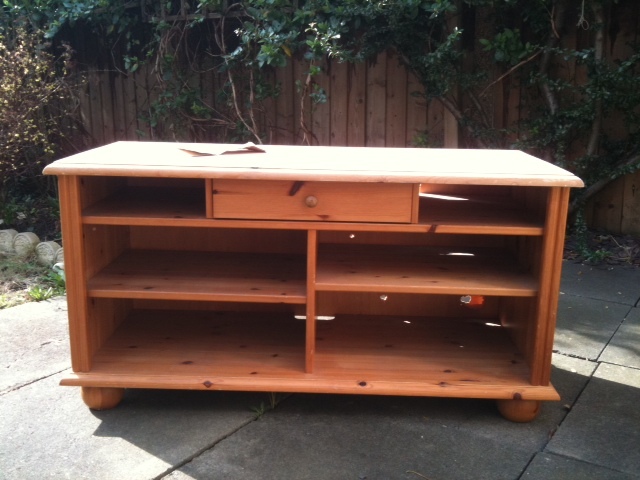 I picked up this old unit for free – who can say no to a rejected orphan and a crafting project rolled into one? 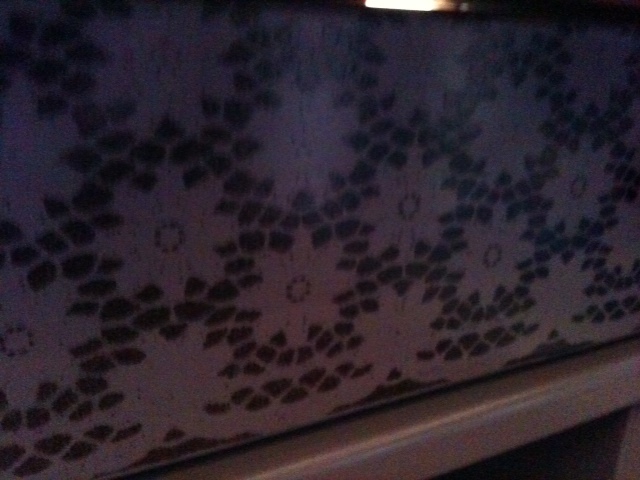 So, all this cost me was a few quid for grey wood paint, black spray paint and lace. Oh, how I love a bargain! I was tempted to go bright with this piece (turquoise? Cerulean blue?) 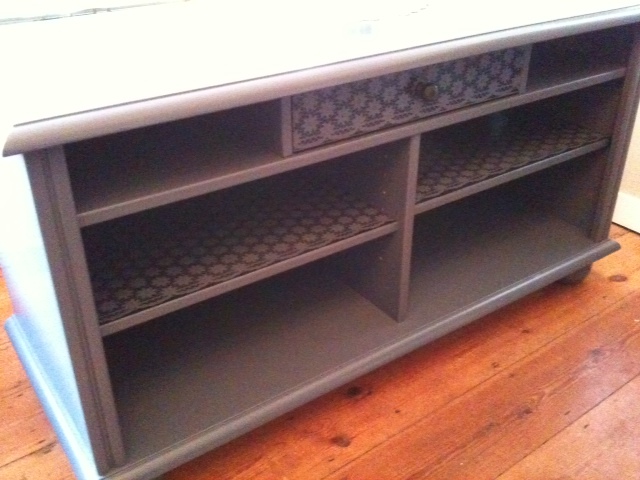 but knew it just wouldn’t work in our sitting room so I went for muted colours. I know I’ll soon be adding more colour with homemade cushions and a poufee! 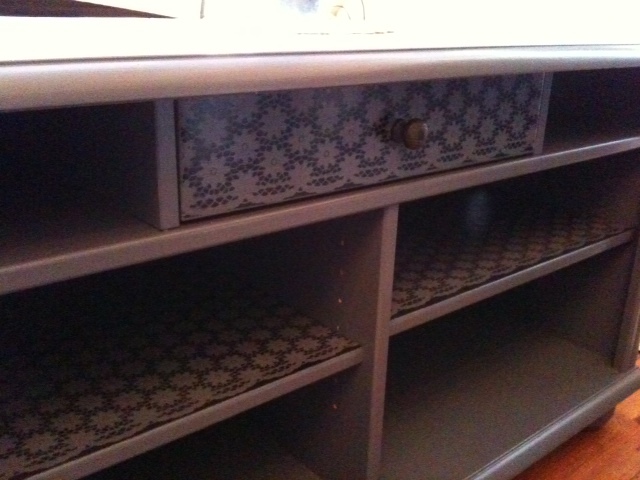 It’s a bit dour but I do love this grey and I jazzed it up a bit with the lace effect detail, which to be honest, I can’t take credit for – I spotted the idea on A Beautiful Mess where you’ll find full instructions. This project is time-consuming as you have to do it in stages – first sanding; then two coats of paint, plus drying time; then spray painting; plus a top coat (I’m into instant gratification so didn’t bother with that bit). But, I love it, so it was worth it and the spray paint idea can also be used for smaller projects like decorating clothing, totes, notebooks etc. Now I’ll just have to find some bright pretty things to put on the shelves. Oh, shame, I’ll have to do a spot of shopping!